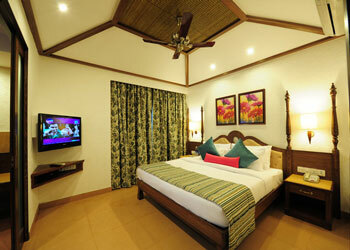 Accommodation in Deluxe Cottage AC room on Twin sharing basis. Bone fire in evening with music and Nature walks along River Kosi. Jungle – Riverside Picnic (group of 15 & above). Bone fire in evening with music. Nature walks along river kosi. This beautifully designed resort provides rooms with nice views. Adamo The Bellus is just a few minutes walk from the golden sands of the Calangute beach. It is 22 km from Thivam railway station & 45 km from Margao airport. The resort comprise of 90 bright and airy, fully furnished rooms and suits with all modern amenities inclusive of well stocked fridge & mini bar. All the rooms are well appointed with balconies overlooking the landscaped garden and swimming pool. Other features include running hot/cold water, coffee maker, hair dryer, etc. Resort facilities include crystal clear swimming pool with separate two kiddies pool, jacuzzi, sauna, steam bath, gymnasium, beauty and massage parlor, a multi- cuisine restaurant, a pool side bar and excellent service. Resort has internet facility and accepts all major credit cards. Distance from railway station: 22 km (Thivam). 5 min walk from calnugute beach. Margao railway sation 60 km.